The illusion of much modern recorded band-oriented music (dance is a whole other trip of course) is that it is played live: the whole band laying it down for you in one perfect passionate take. Of course, since Les Paul in the early 1950s, multitrack recording has allowed the performance to be staggered in time – pulled apart and put back together. The rise of huge multitrack desks in the late 70s and early 80s took multitrack recording to an almost ridiculous level, and of course ProTools has carried recording beyond ridiculous – to a degree where every touch of a hi-hat can be modelled and moulded to diamond-like perfection. There are certain forms of music that benefit from such infinite care and almost forensic sound-shaping. And there are musics that don’t. The latter is music that is based on a rawness and immediacy that is part of its intrinsic make-up – such as Blues. 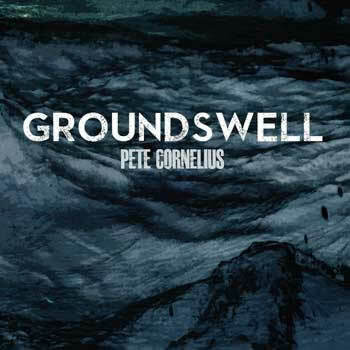 Tasmanian (yes, folks that’s about as far from Chicago as you can get) Blues guitarist Pete Cornelius recorded his new album Groundswell in a neighbour’s holiday house in Elephant Pass, virtually entirely live. And it shows. There is a theory that says that every step of the process between the artist’s heart and the listener’s ear diminishes the emotional force of what the artist is trying to say. If true, that certainly applies to simpler, more direct music such as country, blues and roots where there is not too much left once you strip the emotive power away. Cornelius’ decision to record live was smart, and as good a proof of this theory as I have heard for a while. Cornelius made his name fronting The DeVilles, a hard rockin’ Texas blues powerhouse that matched Cornelius’ SRV-style gun-slinger trip. But the band has settled into a more mellow thing, firstly on Pete’s last album Tumbleweed and the new one Groundswell. As his music has focused on songwriting, it has taken on extra dimension, away from guitar solos and Texas raunch. Not that there are no longer moments of real guitar fire – the Hendrix-howl solo on ‘Repo Man’ shows where Cornelius’ rep comes from. 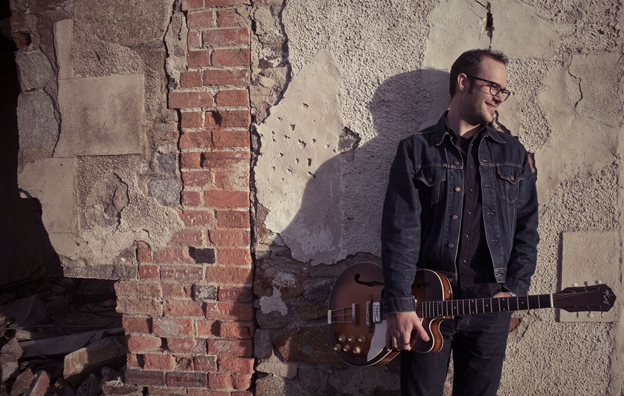 But hopefully Groundswell will give him a parallel rep as a warm-hearted songwriter for songs such as opener ‘Drinking the Blues’ – a sly New Orleans groove – or the very pretty ‘Goodnight My Love’ – a soul lullaby to his new young daughter. And like SRV, like Eric Clapton, Cornelius’ voice is a perfect foil for his guitar-playing – check acoustic closer ‘Strong Suit’, a song so nicely rendered I truly expect to see it covered by other artists. There is a slight country lilt to his voice which works equally well across the Meters-like hipshaker ‘Talkin’ Bout New Orleans’ and the sinewy lope of ‘Cold Water’ (with its wry – and very funny – lyric), and matches the country-blues filigree of his playing. His playing – yes, still dazzling and highly original while still reflecting the colours and shapes of his obvious influences – is nicely balanced against the songwriting and vocal (and great band interpretations of the songs) across the album. A player of Pete Cornelius’ imagination and great fingers could just put out another collection of sizzling jams and the Australian Blues audience would eat it up. It is testament to his musical evolution – that quality that separates out the true long-term artists in any genre – that he went for a wider palette of colours and emotions that make up Groundswell. Drawing has often been seen as the poor cousin of painting. Smaller, more spindly, less colourful – drawing and graphic arts such as printmaking, by their nature, can lack painting’s drama and spectacle. But graphic art has its own power and charm. The art of the line can – despite its smaller size and restricted palette, or because of it – pack a punch. And drawing is where most paintings start – as a sketch, a study or cartoon. Drawing can be the artist thinking with a pencil. The Art Gallery of NSW is currently showing over 130 graphic works from the collection of The British Museum under the title Renaissance To Goya, Prints and Drawings from Spain. It is one of the finest collections of Spanish drawings in the world and Sydney’s AGNSW is the only Australian gallery to display these works on their world tour – a tour which, in a case of carrying coals to Newcastle, also takes in Madrid’s Prado. The exhibition spans time – mid-16th century to the 1800s – and space – the major regions of Spain as well as, in the case of José de Ribera, Naples and of Goya, Bordeaux where the Spanish artists lived and worked. Renaissance To Goya is stunning, packing that unique graphic punch across themes of religion, daily life, myth and – in the case of Goya – social commentary and insanity. Peter Raissis, co-curator says it is an “exhibition about an unknown and untold story” as many of these works have not been seen before. Experiencing the richness of the works on display, that is surprising to hear. Curator Mark McDonald has taken great pains to mix and match unknown artists with the superstars of the age, such as Velázquez, and artists with artisans – many of these drawings are working design sketches for altar pieces and church furnishings. Religious expression and function dominate the earlier objects here – as they did the art of the time – and yet there is great humanity and deep feeling amongst them. 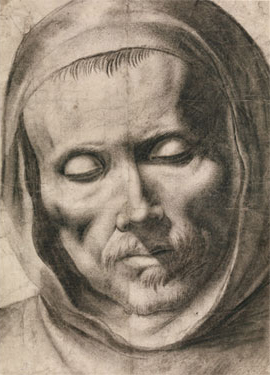 Francisco de Zurburán’s ‘Head of A Monk’ from 1635 is a beautifully meditative study of spiritual peace and aescetism – the gray chalk lines and shading reflecting the simplicity of the monk’s life in a way a painting could not. Spain’s ‘Siglo de Oro’ (‘Golden Age’) of the 17th century is represented by star artists such as Diego Velázquez, Vicente Carducho and Alonso Cano in Madrid, Bartolomé Murillo and Francisco de Zubarán in Seville, and José de Ribera in Spanish Naples. Ribera’s prints in particular stand out for their drama and deep psychological interplays – ‘The Drunken Silenius’, with the drunken demi-god having his glass filled by a satyr as Pan cradles his head, is a wicked little short story, masterfully rendered in drypoint. In the case of Francisco de Goya – the ‘first modern artist’ – McDonald has smartly placed his works among the works of his contemporaries. This serves to show in high relief how singular Goya’s vision was. As his fellow artists continued to present religious themes and works flattering to the royal house (as of course, Goya did – he had to eat), he presented works that held up a clear-eyed and acid-etched mirror to his world. 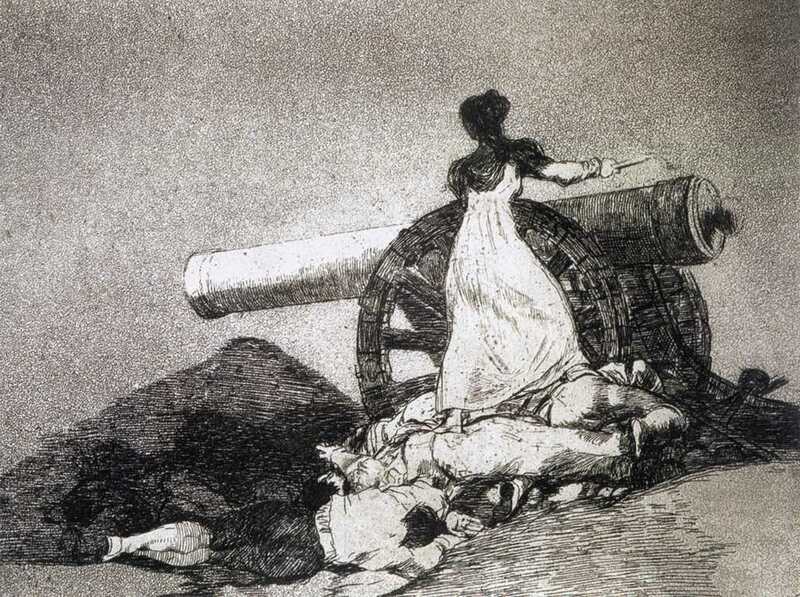 The works shown here are drawn from Goya’s ‘Disasters of War’ and ‘Caprichos’ series. The ‘Disasters of War’ prints show harrowing visions of the butchery and lawless savagery of war, their horrors scratched into the etching plate like so many tiny knife cuts. The ‘Caprichos’ are Goya’s sardonic and merciless lampoons of Spanish society – hilarious but the laughter is bitter. What cannot be denied is the power and graphic mastery of these pieces – a power that arguably he never achieved in the fuller colour and more spectacular scale of his paintings. Renaissance To Goya, Prints and Drawings from Spain is a spectacular bringing together of a form of art that often slips under the radar – it is spectacular but spectacular at a human-scale. The experience is quiet, meditative and full of hushed ‘wow’-moments. We have enough noise and colour battering us hourly, daily. A quiet hour or so spent among these calming, gray blue and ochre works is a precious hour. Sydney go-to guitarist Illya Szwec has to be aware of the irony of titling his new album Introducing Illya Szwec. Ok, it is his debut album as a leader, but the man has been around forever, played with everybody and very definitely needs no introduction. The bio that came with my review copy is two solid pages of star-time names – not two pages of the usual double-spaced flummery, puffing up a thin resume as too many are, but two pages dense with names such as ‘Continental’ Robert Susz (Szwec has played in his Continental Blues Party for the past 7 years), Declan Kelly (gigs and recording on his Adrift LP), boogie-king Don Hopkins, boogie-queen Bridie King, The Wolverines, Wendy Saddington, Jim Conway, Ray Beadle, Johnny G, Eugene ‘Hideaway’ Bridges, and such. 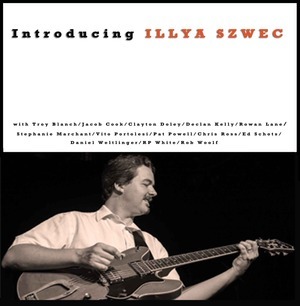 It is such a virtual phone book of Australian blues, rock and roots royalty that it could easily sway my review of Introducing Illya Szwec – hell, that’s what PR is for, right? Which is exactly why I totally ignored it and did my best to listen to Introducing Illya Szwec with clean, unencumbered, objective ears (hell, that’s what record reviewers are for, right?). Open ‘Ain’t Nothing That A Young Girl Can Do’ instantly brought a smile to my jaded sensibilities – a warm Meters-style NOLA groove gently pushed along by Szwec’s gently needling Telecaster. Pure taste – which left me a tad apprehensive as well: there is a musical element in this town which exalts ‘taste’ above all else, sometimes expunging all grit and juice from the music in the process. I hoped this was not going to be the case as I listened deeper. It wasn’t – second track, a cover of Cream’s psychedelic anthem, ‘Sunshine of Your Love’ blew away my concerns. With a cap-S Soulful vocal from Stephanie Marchant and driven by Ed Schots’ muscular horns, Szwec’s ‘Sunshine…’ owes as much to Ginger Baker’s 1970 Airforce version as it does to any number of cooking Stax soul treatments. The sole Szwec composition here, ‘Lois Maxwell’ is a witty and snappin’ piece of James Bond-inspired reggae (the lady of the title is the actress who played the smart but unrequited Miss Moneypenny in many Bond movies). Reggae pops (literally) up across Introducing Illya Szwec on the smooth ‘Missing You’ (nicely felt vocal from Troy Blanch) and in a more funky, ska-hot form on James Booker’s ‘Big Nick’. It is the loose-limbed forms such as reggae and funk that seem to fit Illya Szwec’s musical shape well. 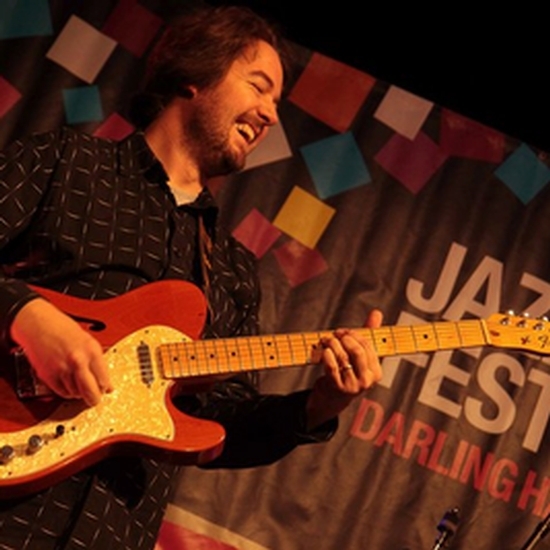 His playing, whether fuzzed-up on ‘Sunshine of Your Love’ or hollow-body howlin’ on ‘Fire Eater’ (driven by Clayton Doley’s happening Hammond), combines a warmth of personality with a cool passion – in short, in common with most great instrumentalists it has a very human voice. He also speaks fluent Blues – hardly surprising as it is of course the Blues which is the dark river that flows through all of this music, like rich blood under skin. Check out Szwec and Marchant’s take on Isaac Hayes and David Porter’s ‘When My Love Comes Down’. Tingle-making stuff. Too often a booked-up super-instrumentalist releases an album that ultimately amounts to not much more than a professional’s portfolio – a kind of aural show-reel of their skill-set – with all the glassy blandness that such an approach implies. Introducing Illya Szwec ain’t that at all. Sure, the skills and craft are there – which is why this album is crammed to the rafters with Sydney’s finest players. But they are all having a time of it, obviously inspired and brightened up by the big heart that beats deep inside Illya Szwec’s guitar playing. 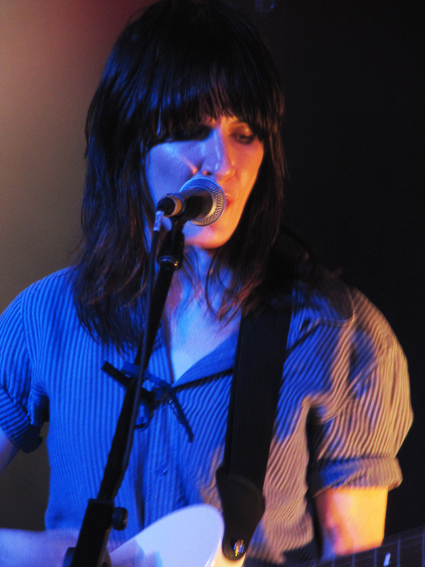 The first time I saw Jen Cloher live, I was at OAF, awash on a sea of sobriety. To paraphrase Lloyd Bridges, I picked a great month to go Dry July. This is rock and roll that needs and expects a certain amount of lubrication to fully dig its loose-limbed swagger, and here I was – sober as George goddamn Pell. I was at the Oxford Art Factory for last night’s Sydney launch of Cloher’s new record, In Blood Memory. After a sparkling guitar-heavy (of course) set from Cloher’s lead/slide guitarist Courtney Barnett and a sweet set of 60s flavoured dream pop from Melodie Nelson, Cloher and her band were on and I was cursing sobriety, temperance and all the wowsers of the world. But I needn’t have worried. Just as In Blood Memory had seduced me from the first listen (my review for TOP is here), Cloher, all black jeans and Jeff Beck hair, and her band put me in the right place from the first note of opener ‘Kamikaze Origami’. The band – Barnett on lead/slide, bassist Bones Sloane and drummer Jen Sholakis – are a true band, a breathing entity that propels these fantastic songs like dancing with a lover, hot but held tender. The vibe on the album is full-blooded and ‘live’ so I was keen to hear how the songs came across with the added immediacy of here-and-now. I was not disappointed – the band, Cloher and the songs positively glowed from the stage, reminding me of everything that is good and bighearted about rock and roll. It was as tight as it needed to be and as loose as it had to be – with just enough tattooed garage grease to make it live in the Now. 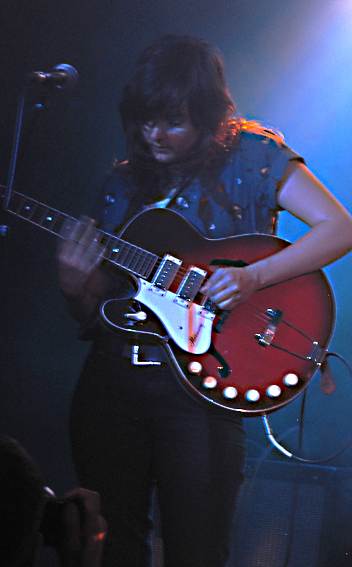 Cloher switched between her Jim Dyson Tele and Strat and drove the band with some tough rhythm – after ‘Toothless Tiger’ the guy next to me said ‘That’s the best Stones song they never wrote’. I had to agree. The band worked through the songs from In Blood Memory and even played a couple that didn’t make the album – one was the wonderfully named ‘Stone Age Brain’, which had Barnett coaxing some hair-raising noise out of her beautiful thrift-shop (a compliment where I come from) hollow-body, displaying what an inventive and lateral-thinking guitarist she is. Another discard from the album was a lovely country harmony piece that Cloher introduced with the tantalising news of an upcoming tour with Mia Dyson and Liz Stringer (quipping ‘Our Crosby, Stills & Nash tour…’). Cloher seemed genuinely pleased at the packed Sydney room and reacted to individual shouts from the audience with good humour. After a few older acoustic songs the band drove into perhaps the most remarkable piece on the album, ‘Name in Lights’ and finished with a howling maelstrom of garage noise. Encore, ‘Hold My Hand’, left us all breathless, and me high as a motherlovin’ kite. This is why I do stupid Dry July – to see if I love what I love for what it is, and not for the party swirl that I worry I need for me to love it. And I love In Blood Memory and Jen Cloher’s rockin’ band. This album positions her as one of Australia’s premier songwriters – one with an entirely original voice and vision. And that originality of vision is more important now that it has ever been, as rock and roll incrementally solidifies into a digital cartoon. Thankfully Jen Cloher is writing better than she ever has, and I hope she never stops.